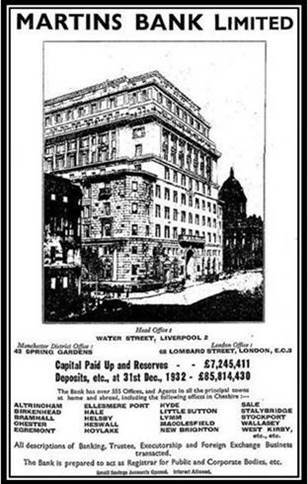 With the advent of the oval shaped metal money boxes in 1921, (see also GIVEAWAYS), nearly every bank is now beginning to attract deposits from people on modest and low incomes. This design classic educates several generations into the idea of putting money aside for the future, and it becomes almost a duty to save for a rainy day – something we could all perhaps learn from in the twenty-first century! 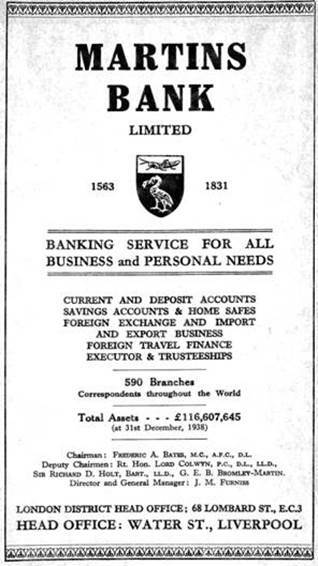 Interestingly, the adverts we have from the 1930s, although occupying roughly about the same amount of space on a newspaper page, are mostly use to provide information about the Bank’s Performance – Facts and figures, details of services and branches, and a reminder that our Bank offers World Wide Facilities. We do however see the emergence of a form of local advertising, with the addition of the address and contact details of local branches being added to generic images and wording. These ads are, however distinctly of their own time, practical and to the point. It won’t be long however, before Martins becomes a little more ambitious with this powerful marketing tool. By the end of the 1930s, advertisements like these for Will Making and Holiday and Travel Services are beginning to show a little more flair. The 1940s will bring a fresher look to our Bank’s Advertising, although it is likely to appeal only to those with money and a good education. 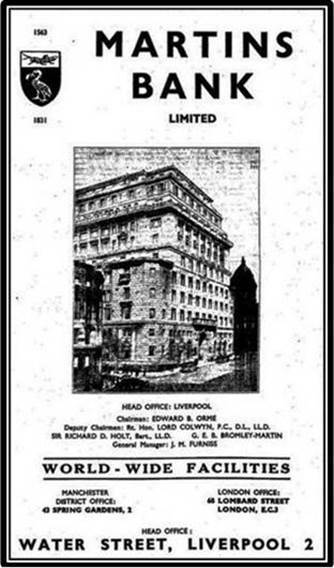 We are still a very long way from the 1960s when it seems that ANYTHING goes, including taking elephants,camels, hippos and zebras into Bank Branches!